Both our mango and painted bookcases promise to bring style and character to your home. Start your own stylish library with one of our painted bookcases, finished in a range of contemporary colours from white to grey and cream. Or, if you’re looking for a bookcase that has a chic, organic finish, our mango designs will add instant charm to your home. Available in a range of sizes and styles, you can find a painted or mango bookcase to suit the wider theme of your living room, office, or bedroom. Whether you want an ultra-modern look or you’re looking to create a classic space, a bookcase is a perfect addition to any home. Investing in a painted bookcase is an easy way to give your space a modern refresh. Our painted furniture ranges include a variety of elegant colours, so you can easily find the perfect bookcase to suit your space. 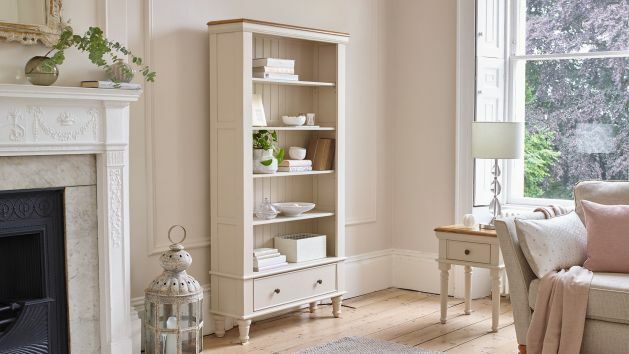 For country cottage effect, consider an antique-inspired bookcase in cream or white. If you want to channel a contemporary look, choose a painted grey bookcase. Available in a selection of heights and widths, you can find a piece that has the storage you need, ensuring your space looks organised and stylish! Our mango bookcases will create a striking focal point, as well as keeping your favourite reads neatly organised. The characterful grain in the wood will add a feeling of high-end beauty to your home. Made with the finest quality mango wood, our designs promise supreme strength and will retain their beautiful texture for many years to come. Boasting exceptionally strong shelves, a mango bookcase is a good choice if you’re intending to use it to store heavy items such as large ornaments or books. When deciding how to style your bookcase, think carefully about the design and how it will impact your space. Enclosed bookcases can make the room seem cosier, as there are no gaps for light to filter through. If your space is naturally dark, try opting for a bookcase with an open back or choose a design in a light-reflecting colour such as cream or white. If you’re placing your bookcase in a large open space, consider using it to add definition to the layout of the room. Create this look by placing several matching freestanding bookcases side by side. Tall bookcases should be anchored against the wall to prevent them from falling over, while small freestanding bookcases can benefit from having a gap around them, to create a feeling of openness. Enjoy free home delivery on all Oak Furniture Land furniture – we’ll even deliver your purchase directly to any room in your house. Our flexible finance options allow purchases over £500 to be spread across monthly payments for up to four years, while orders over £3,500 qualify for interest-free credit for up to three years.